How can I restore a Sony laptop running windows XP to factory settings without CD? Please give me the options for doing it. How to improve the operating speed of Sony laptop running on windows? Is there anyway to reset Windows 7 OS to factory settings without using the Windows installation disk in my HP laptop? Opening emails in maximized format in Sony laptop running windows? 1st METHOD:Sony Vaio usually installs their system files right on the computer. If you click on "Start" then "Vaio Central" a window should open up. Click on the "Support" tab, then Recovery. if it runs windows, start-programs-accessories-system tools-system restore. If not, then use the CD"s that came with it to restore. to restore the computer you need to restart the computer and When the SONY splash screen appears during the computer startup process, press and hold <Ctrl> and then press <F11>. Then, release both keys at the same time. In the Restore window, click Restore. Alternatively, press <Tab> to highlight Restore, and then press <Enter>. When a warning message appears stating that all data will be lost, clickConfirm, or press <Tab> to highlight Confirm and then press <Enter>.The Progress window will appear. Once the restore process starts,it usually takes about 8 to 10 minutes to finish.When the restore process is complete, the following message will appear: The system recovery process was successful. System Restore is the in-built tool of Windows XP, Vista and 7 that allows you to roll back the registry to a previous state. 1.Click on Start then All Programs and then Accessories. 2.Then System Tools and click on System Restore. 3. Click on the Create a restore point radio button and click Next. 4. Type in a name for the restore point and click Create. Make sure to give a name that makes sense like “Before installing driver” or “Before updating program”,etc. Click Create and you’re done! You have now backed up your Windows Registry. Before restoring your system you must be sure about the restoring date. Log on to your PC as Administrator. Go to All Program > Accessories > System tools > System restore. 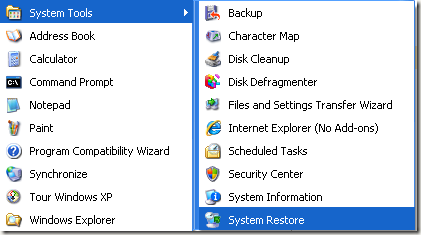 Check the box beside "Restore my computer to an earlier time" option & click on "Next". Now you have to set the restore point in the Select restore point window. Select the date, month & year on the calender option. Set the restore point from the list & click on Next. Click on OK & wait for some time till the process run. Hope this will help you a lot.